An earth satellite tracking station is celebrating its 30th anniversary. Madley Communications Centre in Herefordshire is one of the largest satellite stations of its kind in the world. It opened in 1978 with one antenna but now boasts 65 and handles television, phone and internet communications for the Atlantic and Indian Ocean areas. 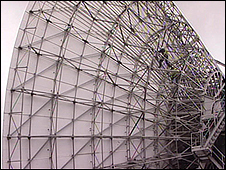 It has handled TV coverage of momentous events such as the fall of the Berlin Wall and Princess Diana's funeral.